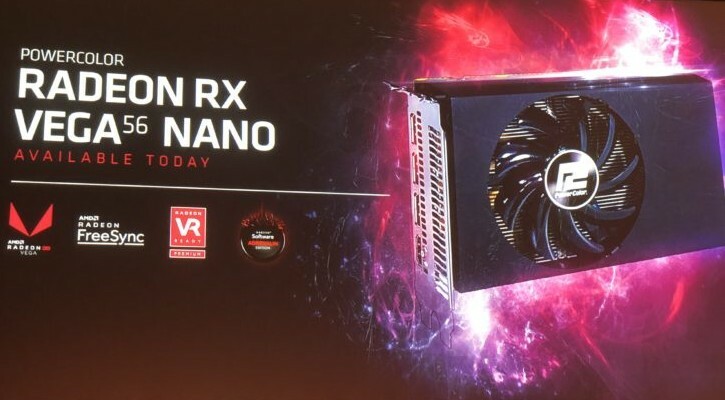 AMD unveiled the RX Vega 56 Nano during a Computex 2018 special press event, but instead a reference edition — as it usually happens — they unveiled a variant made by PowerColor. This video card features 8 GB HBM2 memory, 3584 stream processors, and the same clock speeds as the reference edition: 1156 MHz (base) and 1471 MHz (maximum). After a long wait, the AMD RX Vega 56 Nano video card has been finally unveiled. Although the clock speeds are the same as those of the RX Vega 56 reference edition, AMD chose to show a variant made by PowerColor instead (a card that we already heard of less than a month ago). The new card already has an official product page and, for those who do not like to go through long lists of specs and features, the "PowerColor RX VEGA 56 8GB HBM2-NANO Edition" name and knowing that this board uses the reference clock speeds of the regular RX Vega 56 should be enough. These speeds are 1156 MHz and 1471 MHz for the graphics core's base/boost, while the memory clock ticks at 800 MHz. Obviously, the GPU is based on the 14 nm process and has 8 GB of HBM2 video memory at its disposal, if the name mentioned above was too cryptic for you. Those who missed the RX Vega 56-related news so far should also know that this video card features 3584 stream processing units, DirectX 12 support, a 2048-bit interface, PCI-E 3.0 and HDMI/DisplayPort x3 support. It needs two 8-pin PCI Express connectors and a minimum power supply that can provide 650 W. Since this is a "nano" board, it only measures 6.69 x 3.74 x 1.5 inches. Performance-wise, the PowerColor RX Vega 56 Nano should be on par with the reference edition. There is no information about the price and availability of this graphics card, but they will probably vary depending on the market.